USA Health neurologists are pioneering new and effective treatments for Parkinson’s disease in Mobile, Alabama, as part of our movement disorders program. Dyskinesia refers to a category of movement disorders characterized by involuntary muscle movements; Parkinson’s disease may be the most well-known. But any neurological condition that affects ease, fluency, quality and/or speed of movement is a movement disorder. These can be treated with a combination of therapies including oral medication, physical therapy, occupational therapy, speech therapy, neuropsychological evaluations, botulinum toxin injection therapy (Botox®), deep brain stimulation (DBS) or other types of surgery. At USA Health, we treat patients with movement disorders by helping them manage their symptoms and, when possible, addressing the underlying root cause of the disorder. As an academic medical center, we develop and deliver the most effective care to our movement disorder patients. For that reason, we also offer clinical trials involving new treatments to patients when appropriate. An involuntary contraction of one’s neck muscles that causes the head to twist to one side or downwards toward the chest or back. Involuntary muscle spasms or contractions that result in twisting and repetitive movements. A rare neuromuscular disease with intermittent muscle spasms or twitching on one side of the face. A hereditary, degenerative disease marked by uncontrollable movements of a patient’s face, limbs and torso. A degenerative disorder that affects the nerve cells that control movement; symptoms include tremor, muscle stiffness and loss of spontaneous movement. A condition in which patients feel an irrepressible urge to move their legs, especially at night; also known as Willis-Ekbom disease. An increase in muscle contractions that may impair movement, the ability to speak and even walking. A neuropsychiatric disorder marked by uncontrolled vocal tics and involuntary motor tics; it usually presents in childhood. A trembling or shaking of one’s hands or arms that worsens when the patient attempts even the most simple movements. An abnormal contraction or twitch in the eyelids. The botulinum toxin, known by the brand name Botox, works to inhibit acetylcholine, a chemical that functions in the brain as a neurotransmitter to send signals to other cells. With people who have movement disorders, muscles often contract uncontrollably and involuntarily. By blocking the neurotransmitter that controls an overactive muscle, Botox therapy can provide relief to patients for weeks or even months at a time. Movement disorders such as Parkinson’s disease occur when sections of the brain malfunction in the signals they send. These areas send electrical messages to different parts of the body, causing unwanted rigidity, tremors or tics. 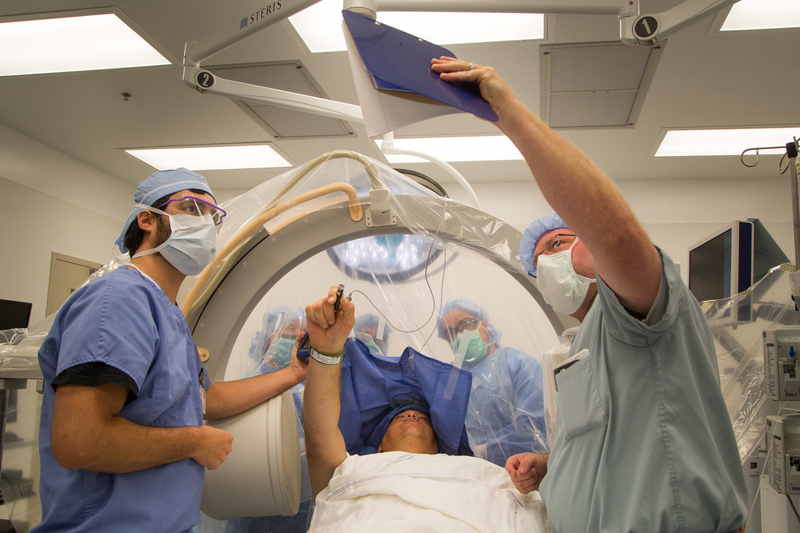 Deep brain stimulation (DBS) surgery involves implanting electrodes on the brain. These electrodes serve as a kind of “pacemaker” for the brain to regulate or block the faulty nerve signals that cause movement disorder symptoms. USA Health staffs a team of neurologists and neurosurgeons who focus on Parkinson’s disease and other movement disorders. If you or a family member suffers from unintended body movements or verbal outbursts, the help you need begins by making an appointment with a USA Health neurology specialist. As an academic medical center, USA Health works to increase knowledge of movement disorders in our health care community by training doctors and nurses in the treatment of these diagnoses.